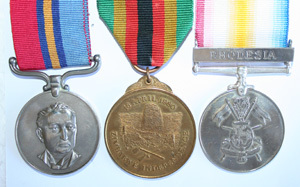 Rhodesian Trio consisting of Rhodesia General Service Medal, Zimbabwe Independence Medal and "For Foreign Service""Rhodesia" Medal. Name mostly removed on the GSM,02684 on Independence Medal, last medal unnamed. These were bought together with the miniature group in the minature section. The miniatures were mounted together, these are not.